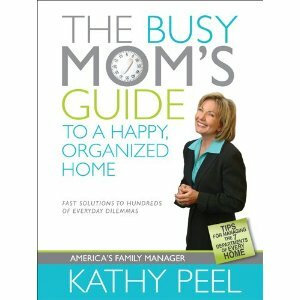 The book “The Busy Mom’s Guide to a Happy Organized Home” by Kathy Peel has a lot of practical solutions to everyday household managing issues such as finances, menu planning, cleaning, and relationships. As a Christian woman, she gives godly perspective and encourages moms to consider what is most important in life. I originally picked this book up at the library because I was looking for a book that would tell me how to “do it all” during the day. I feel like I always have so many things that I want to get accomplished during the day…make breakfast, go to work, keep the house spotless, work on a craft project, play with Job, make dinner, go to the gym, run errands, have a quiet time…. I know that for me I feel like there are so many different ways to use my time, and that if I don’t successfully juggle kids, husband, household, career, volunteering, etc, then I’ve failed, and I know that a lot of other women struggle with this as well. What is more frustrating is that when I look around and see other women who seem like they are doing it all, and then I wonder, what am I doing wrong that I can’t get it all done during the day? Recently I assumed that my problem was that I wasn’tgood enough at organizing and scheduling. If I was better organized, then I’d be able to get it all done, I thought. Hence why I began reading this book. But instead of detailed instructions on how to become a super multi-tasker and Mrs. Efficient, I was so refreshed when I read Peel’s encouragement to become okay with the fact that we can’t do it all and that it’s okay if we don’t finish every detail on our to-do lists. She encourages mom to evaluate what is most important to you and organize yourself accordingly. She also states that our goal should not to become more organized so we have more time to do more stuff, but rather to become more organized so that we have extra time to spend on what we love, like our kids and husbands. By the way, if you are also struggling with feeling like you need to be Super Mom, I was also encouraged by Focus on the Family’s 3 part podcast “Thriving as a Modern-Day Woman.” This series helps women discover what God is really calling them to and encourages women to seek after what they feel their calling is, not just what they feel like they should be doing. This podcast was really encouraging to me that just because other women seem to be doing it all, that doesn’t mean I have to try to do it all. My attitude definitely didn’t transform overnight from being rigid to relaxed about my to-do list, but I feel a lot better with Peel’s practical everyday wisdom and encouragement to just do what I can reasonably do. There is no Super Mom after all, so I shouldn’t try to be one.